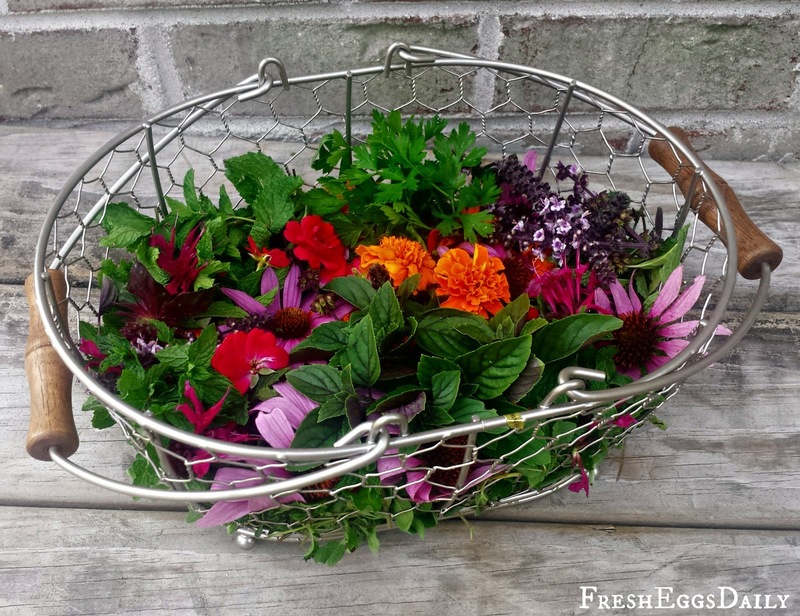 I grow an abundance of herbs and edible flowers each spring and summer to use in my cooking and also to share with the chickens fresh from the garden. Throughout the summer I also dry the excess using my homemade Tiered Herb Drying Rack and then add the dried herbs to our chicken feed in the winter for extra nutrition when they can't munch on fresh grasses and herbs. 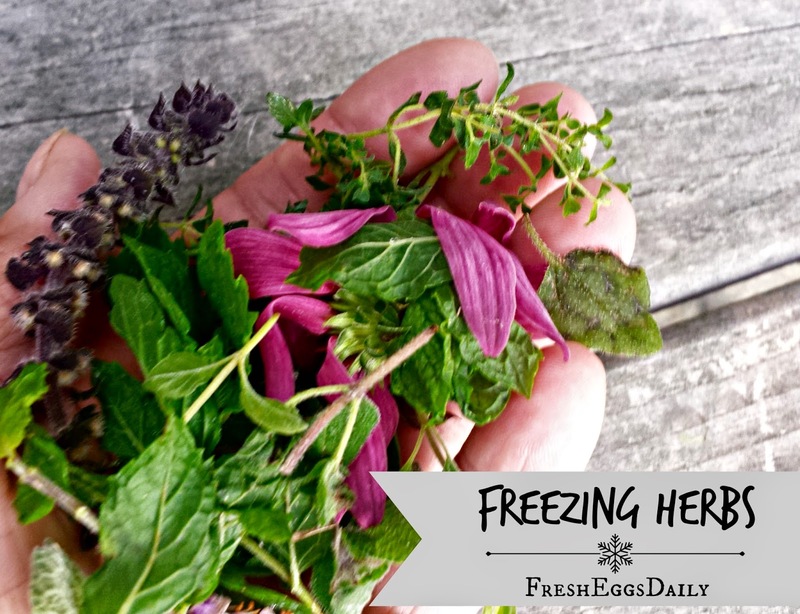 I also freeze some herbs for a nice 'green' surprise for the hens when snow is on the ground. It couldn't be quicker or easier. 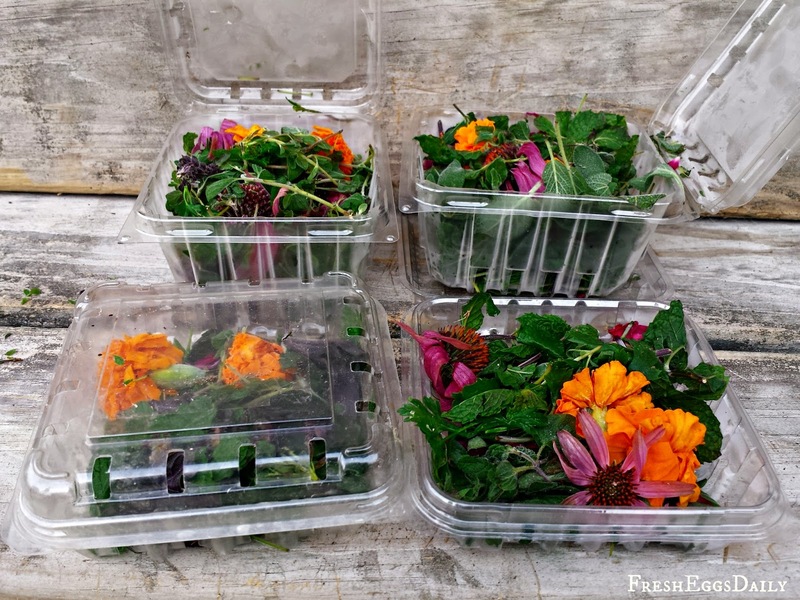 All I do is snip some nice fresh herbs such as basil, mint, oregano, sage and thyme along with some edible flowers such as marigolds, clover, bee balm, roses and echinacea and put them in plastic berry boxes that I save just for this purpose. I don't bother washing the herbs. We don't use any sprays or chemicals on our gardens and I figure any bugs that get collected and accidentally freeze-dried will just be a added bonus for the chickens! I stack the boxes in the freezer and then dole the goodies out over the winter months to give the girls a tasty treat that is super nutritious [read HERE for the health benefit of herbs]. The herbs and flowers retain their vibrant colors and help beat the winter doldrums a bit too I hope! Why not freeze (or dry) some of your excess this summer? I had wondered how to do that. Thank you, Lisa! Couldn't be easier. And it's nice to see some green in the winter! Wondering about the vents in the plastic boxes, and freezing. I'm sure chickens don't care about freezer burn, but I am wondering about what it would do to the nutrient/volatile oils content of the plants. I wouldn't worry because once the herbs freeze nothing is drifting away and nutriens aren't airborne anyway.